A cathedral has cut its music team as it attempts to balance its budget. 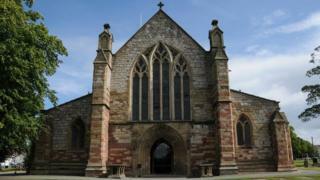 St Asaph Cathedral said "financial pressures" meant it was "no longer able to sustain" the two part-time members of its music department. The director and assistant director of music at the Denbighshire cathedral have been made redundant and thanked for their "high standards". The Dean says temporary changes will be implemented to "properly look after" the singers in the cathedral's choir. The Very Revd Nigel Williams praised director of music Alan McGuinness and assistant John Hosking for "their exemplary performance, hard work and dedication in achieving the high standard of music they have nurtured". "Following a reduction in the budget, which has been under financial pressure for some time, we have had to review the provision of music at St Asaph Cathedral," he added in a statement. The cathedral earns money from a variety of sources, including donations and grants from bodies such as St Asaph Diocesan board of finance, All Churches Trust and the Listed Place of Worship Scheme. As well as having a relatively small congregation, St Asaph does not attract the same number of tourists as other cathedral towns and cities such as Cardiff, Brecon and St Davids.